With so many ‘pesky Brits’ popping up on American screens it may only be a matter of time before US citizenship becomes a criteria for an award show nomination. 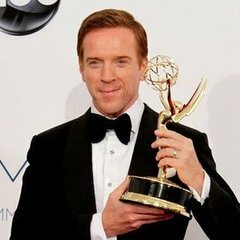 Sunday night’s Emmy’s highlighted that Brit invasion with Dame Maggie Smith snagging an Emmy for her role in Downton Abbey and Homeland’s Damian Lewis taking away the 'Best Outstanding Lead Actor' trophy. Lewis called himself ‘one of those pesky Brits’ in his acceptance speech and host Jimmy Kimmel joked about the influx of Brits saying: “Television is an American institution, yet one out of every five actors here tonight is British. I guess we're supposed to award them because they went to Royal Shakespeare Academy and ours were discovered at the mall." There’s been some speculation about why British Prime Minister David Cameron appeared on David Letterman last night. Some say it was to raise his American profile. The official line was to encourage Americans to visit or set up a business in the UK. Whatever the reason, he should have probably taken a quick history lesson first. Letterman quizzed Cameron on questions about who composed the music for Rule Britannia and what ‘Magna Carta’ meant - both of which he stumbled on. “You have found me out. That is bad, I have ended my career on your show tonight," Cameron said. Granted the questions were hugely irrelevant and allowed for some transatlantic jesting but it’s never nice to see a world leader slightly uncomfortable and a little at a loss on TV. It’s reported Cameron, who is the first serving British prime minister to appear on the Letterman show, was prepared to answer questions about the Queen and even studied previous appearances on the show by London Mayor, Boris Johnson and President Obama. The other guests on Letterman's English-themed show included British actor Jonny Lee Miller and music from English rock band Mumford & Sons. Ex-Baywatch star David Hasselhoff is about to invade the UK. The actor, who’s been dating his Welsh girlfriend Hayley Roberts since last year, has apparently fallen in love with the place and is planning to move there although it seems he can’t decide where. Some reports say the Hoff is looking at a Welsh mansion on the outskirts of Cardiff and others say he’s got his eye on cottage in the Cotswolds in England. Hasselhoff says he considers himself an honorary Brit so wherever he ends up there's a chance he'll become a regular on British TV too! Four international Princes come to Atlanta looking for love. Sounds crazy but it’s true. TLC’s new five-part series ‘Secret Princes’ airs on Friday nights and is a remake of the UK version ‘Undercover Princes’ from 2009. The Princes, two from the UK, one from Spain and the other from India, look for their Princess Charming while undercover, immersing themselves in American culture.